Browsing articles tagged with " Chevrolet Camaro"
The 580 horsepower Chevrolet Camaro ZL1 production has been halted due to “quality assessment”. All Camaro ZL1 models produced to date are currently being held by General Motors for a quality assessment. At this moment, the duration of the hold is undetermined, and may last a few more weeks. 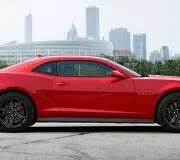 As soon as the hold is cleared, a note will be sent to all dealers to advise that 2012 Camaro ZL1 shipments are underway.